At some point after we bought our land, we were struck with a sense of responsibility regarding our land. A lot of farms in our area have been subdivided, like ours, into small 'lifestyle' blocks. What this means is that formerly productive parcels of land have been 'taken off the market' with regards to their capacity for feeding the local community (though of course a lot of farms around here are in the business of producing for the export market or for a particular big cheese company). With this sense of responsibility in mind, we developed some vague notions of producing a lot of food for ourselves and at least a little bit of food for the wider food community. If everyone produces a bit of food for themselves and some for the community, then we'll have a better chance of developing secure local food networks, and therefore prove to be a little more resilient when the big P.O (that's Peak Oil, in case you're wondering) and when serious climate change comes. It really feels as though the current industrial food system is finite. Not only is it environmentally unsustainable, it's making us sick (think heart disease, cancer, type-2 diabetes, increasing rates of asthma, food allergies and so on and so on), animals are compelled to live miserable lives and it's a system that's providing a terrible living for many primary producers. We know there are better ways to feed ourselves. We've been supplying our local food co-op with greens for a while now, going to food swaps, and generally bartering veggie goodness for things like art lessons and loaves of amazing sourdough bread, and this has been a nice, if somewhat inconsequential contribution to our local community. But yesterday, we officially launched into a bit more serious operation, namely raising pastured meat chickens for a small network of locals who have subscribed to our pastured poultry CSA, Autumn Farm. The pasture raised meat chicken thing came about mostly as a result of reading a lot of Joel Salatin, and going to visit Taranaki Farm last year, where we met and chatted to the man himself. And yesterday, after some months of preparations, building works, reading, and volunteering at the local small species abattoir (where our chickens will be processed) we picked up our first lot of 100 day old chicks. And, I'm sorry to say, they're really really cute. As I've written before, killing things does not come easily or naturally to me. But it was important for me to know that, if we were going to become meat producers, I'd be able to steward the animals all the way through their lives. So a few months ago I got involved with the abattoir, which is an amazing and unique facility, just down the road from our house. It's a producer-run co-operative, which, as well as processing birds for small, localised growers like us and Symphony Farm, from Tilba, also processes 'home kills' for people who want to raise their own meat but aren't able or don't want to process at home. This is a fantastic local resource, and we feel really happy that our birds will be going through this abattoir. I also feel proud, if somewhat apprehensive, that I'm going to be with them right to the end, not just sending them off to be processed somewhere else. For us, it feels like this kind of small-scale, grower-controlled production of meat is a sustainable and ethical answer to the question of meat production. Obviously, in an ideal world, people who wanted to eat meat would raise their own animals, and kill it themselves in the paddock where it lived. No stress for the animal, no food miles, and we can guaran-damn-tee you, people would probably eat less meat. But this system just isn't possible. So the next best option is for localised small (and large) farms to grow meat for their local community. So far, the response to Autumn Farm has been amazing. People have been super-keen to get their hands on some locally-grown, pasture-raised chooks, and our first batch of chickens is fully subscribed! These chickens, as well as sustaining our local community, will be naturally fertilising our land, as we move them all around in their movable hoop houses. The hoop house will be surrounded by electric mesh fencing so that by day, they can scratch around and nibble and do chicken-y things on the grass in the sun and by night, be safely enclosed in their hoop house with the electric fence offering extra protection against the predations of local foxes. One of our main objectives (in addition to feeding our community) is to connect people with their food, to talk to them about how it's raised and also how it's killed. It feels as though a lot of the problem with our industrialised food system is the mere fact that people just don't know how their food is produced. We're talking to our customers regularly, sending out an email newsletter and posting updates on facebook. And the chooks, once they're 'done' will be picked up by our customers from the abattoir on the day they're killed. This means that the chickens will be super-fresh, obviously, but it also means that people won't be so divorced from the processes involved with getting their meat to the table. Chickens aren't all we have planned for our little farm. Over time we will develop a more integrated system - some sheep, couple of cows, pigs from time to time all within an interlinking system of regenerated bushland, food forests and small scale grain production . Realistically, this is a 10-15 year plan. So we're really just at the start. But for now, we have plenty of grass and we know these chickens will live a happy (albeit brief) life in the sunshine on our grassy bit of hill. A little bit of Spring bounty..
We've had some sickness in our tiny house lately. Weeks of it. Fluey, pneumonic kind of illness. Consequently, things have been slow in these parts as we've all been decrepit. Yet despite the decrepit, we have managed to observe and celebrate the advent of Spring. Cause for great celebration has been the big rain we've had. Joy oh joys. Bloody great. I laugh at myself a little now when I think about how obsessed I am with checking the rainfall. It never would have occurred to me when we lived in Sydney. Now I talk to everyone about it, which works fine when talking to people around town. But I must admit I do get a little self conscious when I catch myself recounting our rainfall in mm's to our Sydney friends. However when you've just planted 800 native trees and shrubs and you rely on tank water and you have year old fruit trees that you are hoping to see some serious growth on this Summer and you have vegetables to grow and Summer time garden beds to create, well rain does become all. One recent Sunday, before the big rain, we'd had a little rain (25mm in case you're curious). Our coughs were almost gone, the air was mild and the raindrops in the trees were glistening in the morning sun. It felt good. We'd just noticed the globe artichokes were coming on and the broad beans were standing to attention. Huzzah! Let the Spring eating begin. Excellent. We've probably talked about it before, but there is real joy to be found in eating seasonally. Not to get too ranty, but we just don't need tomatoes and watermelon in July. We just don't. They don't taste good, they'e come from far away and it's so weird, this concept that we can have what we want whenever we want. Not to get all Socialist mumma on you, but I can't help but feel that this devastating sense of entitlement will be our undoing. We've been eating a lot of kale, cabbage, root veg, chard, pumpkin (still working our way through our Autumn haul)and leek lately so the growth of the broad beans and artichokes is cause for some joy. New flavours, new recipes, new eating, new ideas, new conversations.... what could be better? I had been waiting for the broad beans because I was wanting to cook the meatballs with broad beans and lemon from Yotam Ottolenghi and Sami Tamimi's Jerusalem. They suggest it makes a perfect Spring supper, and we'd have to agree. Truly truly delicious. This is my favourite kind of food. Food that is rooted in the seasons, real food with real flavour. It's easy to make with what's fresh in the garden and the spices in the cupboard. We will eat it many times this Spring but only while the broad beans and spring onions flourish in the garden and local lemons abound. There were about six globe artichokes ready for the picking. Just six. There are many more to come but as you'd probably know, you can't wait for the littlies to be ready because in that time the artichoke heart will turn to flower. Beautiful purply blue flower but heartless flower nonetheless. So while it felt a little ridiculous to be processing just six artichokes, preserve them I did. We'd been studying Preserving the Italian Way for pig recipes. Yes, pig. We bought a pig from a friend and made many wonderful things with it (yes this will be a post, soon) But of course preserving the Italian way is about more than just the pig, so we turned to it for artichoke inspiration. It's very simple really. You peel the artichokes back to their heart, leaving them in floury water (to stop them browning) while you peel the rest. Then boil them up for 5 or so minutes in a mix of water, white wine vinegar, lemon juice, cloves, bay leaves and garlic. Then leave to cool and drain for hours and hours. 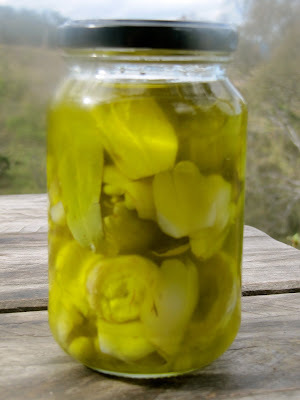 Then put in a jar with some olive oil. One jar is all we got, this time. But this week there'll be another seven artichokes and a few weeks later there'll be more and so on. By the time Summer hits, we may well have stocked up on several jars and they will provide some good eating on pizzas and in salads this Summer. Apparently you can preserve scotch thistles in the same way as artichokes. Have you ever tried such a thing? Of course, they are related but little did I know you could eat an actual thistle. Apparently you need to catch the thistle just before it flowers. Annie and Olive and Oscar traversed the land in search of some scotch thistle at this very juncture in its life cycle. Strangely they only found a couple. I gave it a good try, carefully peeling back the prickly "leaves" but ended up with a thistle heart so small it made no sense to preserve it. I thought maybe we'd picked it too early? But any later and they'd be flowering. We've got some more thistles, on the brink, so maybe this week I'll give it another go. In the last 24 hours we've had just over 80mm of rain. Not exactly flood material (though the river is up, Pearl happily reported when she arrived home), but as anyone who's depended on tank and/or dam water will tell you, it's pretty great. Ducks are happy, snails are happy (grrr), garden's happy, newly-planted 800 shelter-belt trees are happy. And pretty much every conversation I've had in the last day or so has involved at least a little bit of "how good's the rain!? ", and/or excited comparisons of mm's fallen into different friends' rain gauges around the traps. The excitement (and relief) around town is palpable, and kind of nice. Olive and I took advantage of the situation by designating today a 'reading day', which comprised much lolling in the loft finishing various novels, eating scrambled duck eggs, drinking tea, and peeking out the window intermittently to admire the rain. It also involved a couple of mad dashes outside in raincoats and gumboots to check on the situation with our overflowing duck dam. One problem with living in a climate where it doesn't rain that often, is that sometimes when it rains quite a bit, you're not prepared. This of course, is very silly: the less rain you get, the more prepared you should be to catch the rain when it does fall. In some ways, we do OK with this. Our tank is slightly larger than the tank recommended by the quite handy tankulator site, for our tiny roof catchment. When I was researching tank size, I figured it'd be better to have a tank that's never completely full than a tank that ever overflows. So far, we've been lucky in that our tank is big enough to catch all the heavy rain that falls, so we can take advantage of it in dry spells. The little duck dam (OK, OK... It's kind of more of a pond..) on the other hand, is way way way too small for the catchment it has. The duck dam receives water off the road, which is caught by our driveway and an under-the-road-culvert and delivered into the swale that runs through the orchard, which in turn runs into the dam. This is great, and it means we catch a lot of water when it rains even a little bit. But the dam isn't big enough to hold it all. After rain like we've had today, I suspect it's maybe only a third as big as it needs to be to take advantage of rainfall like this, let alone anything more substantial. I can't even tell you how frustrating it is to see a dam overflowing water that I know we'll desperately need in 2, 4 or 6 months time. Not to mention kind of stressful when the rain is rushing into the dam at such a rate that the spillway can't cope and water starts flowing over the dam wall. The obvious answer is, of course, to extend the dam, but that's easier said than done, mostly because it will involve a fair chunk of money and getting an excavator out to do it. But it will be done, sooner rather than later, especially given that people are saying it'll be a wet Spring... Though people also said that about Winter and it didn't really happen. So I hope you, dear reader will learn from our mistake: carefully consider your catchment before you build a dam or pond even if you're simultaneously thinking about something exciting like an earth floor. Especially if there's a road involved. Those buggers catch a hell of a lot of water.